We are excited to unveil our latest online Survey Editor with Device Preview. The Survey Editor is a web based drag and drop designer that makes it effortless to create a questionnaire. Insert, move and copy/paste questions with just a few simple mouse movements. No programming is required to create your survey or form. Every aspect of the Harvest Your Data survey editor has been designed to be simple to use, without compromising advanced complex functionality. The user interface supports large questionnaires and forms. After creating a questionnaire it is easy to see why customers say that it is the most intuitive online survey maker on the market. 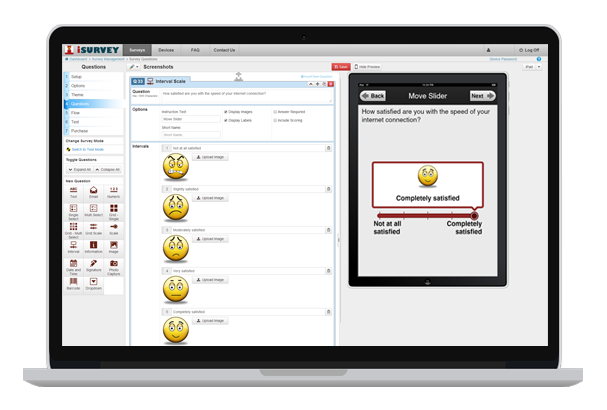 Harvest your Data is the only mobile survey software that has a real time device preview for creating a questionnaire design. The Device Preview displays a simulation of an iPhone, iPad and Tablet. See how your survey will look as you create your questions. To save time, use the Device Preview to quickly test your survey layout and design. Check out what works and what doesn’t instantly, without the hassle of uploading each and every iteration to your mobile device. Collaborate with colleagues during the questionnaire design phase of your survey by emailing a link to your device preview. Colleagues can interact with the simulated device preview and step through your survey design without having a physical device.